Mums in full bloom. We carry a selection of gorgeous colors and varieties. 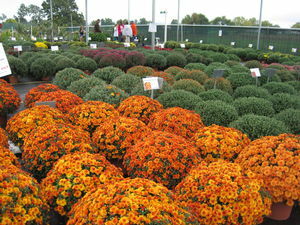 Mums, Asters, Pansies, Violas or flowering Kale and Cabbage are all excellent flowering plants for fall. Even fall vegetables and greens can be used for both decorative and edible purposes. For a list of plants available at Milmont this fall, please see links at left. Since supply and demand changes frequently, feel free to call us at (540) 943-8408 to check stock. 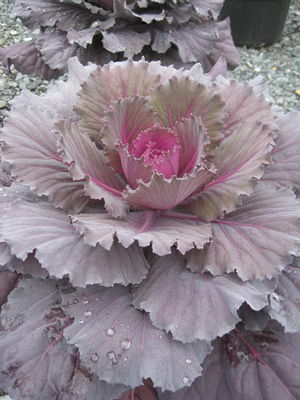 Flowering Kale and Cabbage make beautiful fall decor in the garden. NOTE: Fall bedding plants are usually available at Milmont by late August. Most fall bedding plants are considered annuals; however, some varieties may return, especially after mild winters. The item number is included for your convenience. Milmont has a wide variety of flowers for fall, as well as an assortment of helpful Articles & Tips to help you have a beautiful and successful garden.